We all deserve a smile that is healthy, beautiful, and one we can be proud of. However, when experiencing the negative repercussions of missing teeth, it can be difficult to feel confident about your dental appeal. At Haddonfield Dental, our team of highly experienced and compassionate doctors specializes in many treatment techniques, so patients can comprehensively restore the health, function, and beauty of their smile with skilled implant dentistry. Patients visiting our accommodating office in Cherry Hill can have full confidence in their care as our team proudly provides complete dental implant treatment at our practice. From your detailed consultation, precise implant placement, to affixing your natural-looking restoration, Drs. Lindsay Wessner, Shannon Cole-Ahlo, Joseph Ahlo, Jonathan Mendia, and Julio Espinoza, welcome the opportunity to rejuvenate your smile with dental implant treatment under one roof. Looking for a team of enthusiastic dentists and specialists who have years of experience in restoring patient smiles and appearance? Contact Haddonfield Dental, where the sciences of dentistry and passion for helping others meets the art of rebuilding smiles. Implant dentistry is the entire process of receiving and completing dental implant treatment. It focuses on determining if you’ll be an ideal candidate for implant placement. The primary goals of implant dentistry are to restore teeth, dental function, preserve jawbone dentistry through proper stimulation, and achieve optimal oral health. What Does Implant Dentistry Involve? During this part of the process, Dr. Joseph Ahlo examines your smile and determines if it meets the necessary requirements to receive dental implants. Those who wish to proceed with this restorative procedure must have enough jawbone density to hold the implants in proper place. However, we happily provide initial treatments such as bone grafting for those with insufficient bone volume which gives them the opportunity to possibly undergo implant treatment. Our team proudly provides this treatment so that patients can experience a truly comprehensive approach to all stages of care. Patients must also have no signs of infection within their dental anatomy; if there are signs of compromised dental structures, they must receive treatment before receiving dental implants. During your consultation, impressions of your smile are taken utilizing digital imaging and other innovative technologies. These impressions give us accurate blueprints to determine optimal placement for your implant post or posts. Dr. Ahlo is an experienced periodontist with many years under his belt of placing dental implants. He combines modern techniques and state-of-the-art technology to ensure the desired outcome. To keep you relaxed throughout the procedure, we also provide all sedation options and local anesthesia to maximize your comfort. Our periodontist will not proceed with the placement of your dental implant until he knows you are relaxed and aware of every step of your treatment. At the time of surgery, our Cherry Hill dental professional inserts the post, so the surrounding supporting structures are continuously stimulated, and healthy bone growth is encouraged. Once you have received your dental implants, it can take up to several weeks for ideal healing. You will be unable to obtain your final restoration until the surrounding bone has fused with the post and the soft tissues have healed. This process, known as osseointegration, is vital for successful implant treatment and may take up to six months to complete. At Haddonfield Dental, we offer crowns, bridges, and dentures which are permanently affixed to your dental implant or implants. Depending on the number and location of missing teeth, we only recommend the most ideal solution to meet your dental needs and goals. Our restorations are made from life-like porcelain and ceramic, meaning they are aesthetically pleasing and will look, feel, and function as your natural teeth. Although proactive brushing and flossing daily and keeping up with your dental visits every six months can significantly help prevent against tooth loss, sometimes the condition can always be avoided with proper hygiene. Whatever the cause of your tooth loss, missing teeth must be replaced. This is not only necessary for your dental appeal, but your oral and overall health as well. Be sure to contact our team to discover which tooth-replacement will best suit the needs of your smile. How Does Missing Teeth Affect Me? Missing even one tooth has numerous negative consequences. First, missing teeth will greatly affect your face’s natural features. Not only will your smile be affected by missing gaps, but if you're missing too many teeth, the skin around your mouth is not properly supported and will begin to shrink, making for prematurely- aged appearances. Also, because there are no healthy tooth roots, missing teeth will make it harder for you to properly chew your food and may even affect your ability to speak. Tooth roots are also extremely vital to upkeep your jawbone’s volume. Without the chewing force, your jawbone shrinks in a process called resorption. Lastly, missing teeth may have emotional consequences. Many individuals feel less confident about their smile when teeth are missing. If you're experiencing tooth loss, consider comprehensive replacement with dental implants. 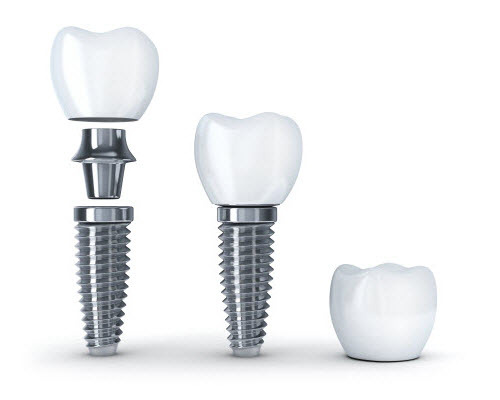 Crowns- are used to finalize dental implant treatment. They are affixed to a single implant that was previously surgically placed into the jawbone. Implant-supported crowns replace a missing tooth, from root to crown. For patients with a single tooth missing, an implant-supported crown is an optimal option. Bridges- are devices that literally “bridge” the gap between remaining teeth and where your missing teeth used to be. These restorations are often attached to neighboring teeth for long-lasting support. However, when attached to implants, bridges are affixed to two or more dental implants for complete replacement without altering any other remaining teeth. Dentures- are appliances that consist of numerous artificial teeth that are recommended for replacing many to up to an entire row of missing teeth. Because implant-supported dentures are secure while mimicking the look and function of a full set of teeth, you can enjoy them without the worry of them becoming loose are dislodged. Dental Implants- can offer a sturdy, long-term solution for tooth replacement. Most choose to replace missing teeth with dental implants because they are the most versatile, natural-looking and can last for many years, even decades with proper care. Dental implants are titanium posts accepted by the body which serve as artificial tooth roots for completely replacing teeth lost due to trauma, extraction, extensive decay, or from severe gum disease. When your permanent restoration is affixed to your dental implant, they are created to look, feel, and function just like natural teeth. Implant posts are surgically placed into the jaw and offer patients with long-lasting tooth replacement primarily because of their ability to fuse with living tissue and bone. This process, called osseointegration, provides restored strength and durability to your jawbone. A strong and healthy jawbone is vital to successful implant treatment. The implant post is the bottom of the implant that serves as the artificial tooth root. It is the part that is physically embedded below the gum line which fuses with the jawbone to become a permanent part of your smile. The post is made of titanium and has a cylindrical, screw-shaped design. The titanium material is accepted by the body and can assist with the osseointegration (fusion) process. 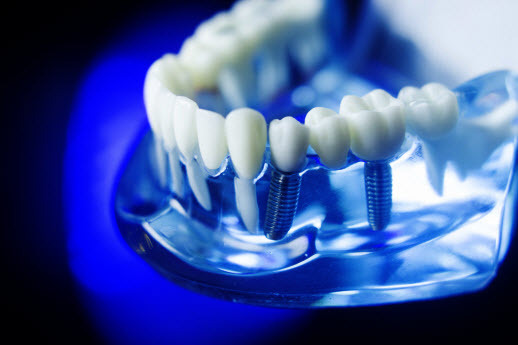 Once the osseointegration is complete, the abutment is screwed into the fixture and will eventually hold the restoration that becomes part of your smile. The prosthetic, or restoration, is the dental crown, bridge, or denture that is affixed on top of the abutment, attaching it to the implant structure. They are either cemented or screwed into the abutment. The prosthetic is designed to look, feel, and act identically to your natural teeth. Dental implants are unlike any other tooth replacement available and their advantages go far beyond helping you achieve a great-looking smile once more. Receiving dental implants will provide a wide variety of comprehensive benefits including aesthetics, function, health, and overall health. Am I a Good Candidate for Implant Dentistry? Ideal contenders for implant dentistry must be in good oral and overall health. Adequate jawbone volume is vital for the implant post to be supported properly. The best candidates must also have healthy gum tissues that are free of disease or infection. Because dental implants must fuse with gum tissues and the underlying jawbone, our team will work you to determine in you qualify for initial treatments, such as bone grafting. We not only determine if your current oral health is ideal for dental implants, but we will recommend any preparation treatments like bone grafting, sinus lifts, or gum grafting, to make implant placement an achievable reality. If during your examination your jawbone is determined to be too soft or that there isn’t enough volume, a bone graft may be recommended to you to ensure implant placement is successful. During the procedure, we take a section of bone from another area of your body, or use a special bone grafting material, and graft it into your jawbone. You will then have to wait several months, while the graft creates enough new and strong bone volume to make sure that the implant will be stable and secure. A sinus lift also called a sinus augmentation, is a surgical procedure which adds bone to your upper jaw in the area of your molars and premolars. During the procedure, bone is added between your jaw and sinuses, which are on either side of your nose. To make room for the bone, the sinus membrane must be moved upward, or "lifted." Sinus lifts are performed in our office, by our reputable periodontist. A sinus lift is necessary when there is not enough bone height in the upper jaw or when the sinuses are too close to the jaw for a dental implant. When gum tissue recession happens due to prolonged tooth loss, a gum grafting procedure may be necessary to rejuvenate the lost gum tissue taken from other areas of your mouth, like the palate, so that your dental implant can fuse properly. Without full, healthy gums, natural teeth and dental implants are unable to stay securely in place. With a gum graft, vital gum tissue is added to your smile, significantly increasing your chances at successful implant placement and treatment. Still Have Questions about Implant Dentistry? Ask Us! When visiting Haddonfield Dental for implant dental care, it’s important to gain as much information and understanding of your treatment. Here are some helpful questions to ask our team! How much does insurance pay for dental implants? Contact Our Cherry Hill Practice for Comprehensive Implant Dentistry! If you are looking for a highly-skilled team that takes into consideration your needs and goals as well as walks with you through every aspect of your dental implant treatment, contact Haddonfield Dental. Our compassionate doctors are eager to help you regain optimal dental function and help you achieve a healthy, beautiful smile once more.